Stronger economic growth provides an impetus for innovation and quality in dental medicine. This is one of the findings of a study which the GFDI (Gesellschaft zur Förderung der Dentalindustrie) commissioned the Berlin market research and consulting firm REBMANN RESEARCH to conduct. 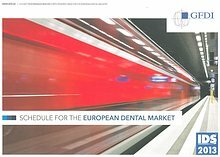 Both partners have now presented the central results of their study, the SCHEDULE FOR THE EUROPEAN DENTAL MARKET, at the 35th International Dental Show in Cologne. These indicate that those countries with a stable economic situation and high proportion of self-payers offer ideal opportunities for high-quality, innovative products. Request a Brochure. To have your brochure posted to you, fill in the form and click the 'Send' button.